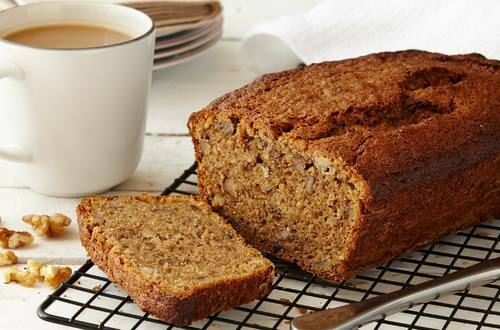 A quick, tasty, super-moist banana bread recipe with chopped walnuts. The Hellmann's® or Best Foods® Real Mayonnaise raises this dish to a new level. 1 Preheat oven to 350°. Grease 9 x 5-inch baking pan with no-stick cooking spray; set aside. 2 Whisk egg, brown sugar, bananas, Hellmann's® or Best Foods® Real Mayonnaise and vanilla in large bowl with wire whisk until blended; set aside. 3 Combine flours, baking powder and salt in medium bowl; stir in 3/4 cup walnuts. Fold into banana mixture just until combined. Turn into prepared pan; smooth top. Sprinkle with remaining 1/4 cup walnuts. 4 Bake 1 hour or until toothpick inserted in center comes out clean. Cool on wire rack 15 minutes, then remove from pan and cool completely. * Tip:  Also terrific with Hellmann's® or Best Foods® Light Mayonnaise.